Alison Hawthorne Deming describes in this book locales that are dear to her because they are still shaped by nature. She begins along the shores of the North Atlantic, on Grand Manan Island in the Bay of Fundy, and moves on to Provincetown, Massachusetts; Tucson, Arizona; and Poamoho, Hawaii. Deming argues that the farther we remove ourselves from wild settings, the farther we are removed from our spiritual center. 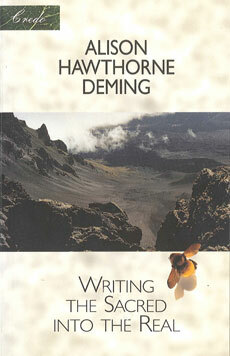 Offering nature writing as a deliverance from our frantic times, Deming encourages a stronger connection with our surroundings. She believes the arts allow us to fall again ”into harmony with place and each other,” to write the sacred into the real. Books in the Credo series explore the essential goals, concerns, and practices of contemporary American writers whose work emphasizes the natural world and human community. Often employing metaphor, Alison Hawthorne Deming makes connections between the unknown and the possible, creating a kind of understanding that is different from the observable. . . She realizes the need for something to replace the closeness with nature that grows from remaining in place, a closeness threatened in a mobile culture.